With Anaheim Automation's huge assortment of High-Torque Stepper Motors, a customer can select the most cost-effective solution, never sacrificing quality or system performance. The stepper motor product line ranges from the smallest NEMA 08Y series with up to 4.2 oz. inches of torque, to the largest NEMA 42K series with up to 5,700 oz. inches of torque. The stepper motor line includes Specialty-Type Stepper Motor, such as IP65-Rated Stepper Motors and Integrated Stepper Motor-Driver-Controller packages, wherein the driver/controller circuitry is built into the stepper motor assembly (See Stepper Motors with Integrated Drivers/Controllers). Most high-Torque Stepper Motors have a 1.8-degree step angle as standard, yet other step angles are available. Four, six and eight-lead configurations are standard for Anaheim Automation's stepper motor product line, and are model dependent. Other options available are conduit boxes, special stepper motor windings, shaft modifications, as well as cable, connector, encoder, brake, and gearbox adders. The 08Y High-Torque Stepper Motor series is offered in two stack versions, with torque peak torque from 2.5 to 4.2 ounce inches. These 1.8°, four-lead motors are available in single and double-ended shaft models. The 11Y High-Torque Stepper Motor series is offered in three stack versions, with peak torque from 8.3 to 16.7 ounce inches. These 1.8°, four-lead motors are available in single and double-ended shaft models. The 14Y High-Torque Stepper Motor series is offered in three stack versions, with peak torque from 9.0 to 19 ounce inches. 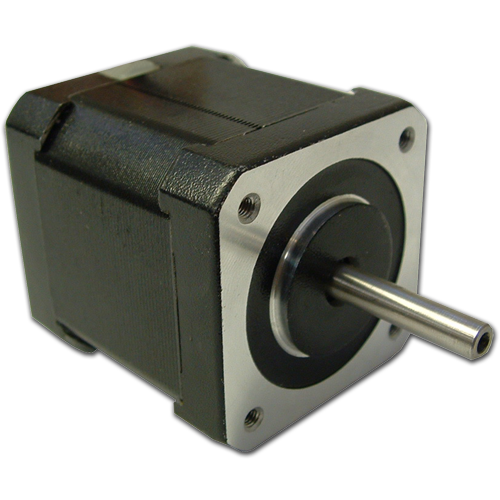 These 1.8°, four-lead motors are available in single and double-ended shaft models. The 15Y High-Torque Stepper Motor series is offered in four stack versions, with peak torque from 9.0 to 50 ounce inches. These 1.8°, four-lead motors are available in single and double-ended shaft models. The 17Y High-Torque Stepper Motor series is offered in five stack versions, with peak torque from 24 to 100 ounce inches. These motors are 1.8° with four lead wires as standard, but are available in other step angles and wire configurations, as well as single and double-ended shaft models. The 17Y9 series offers smoother stepping that the 17Y Series due to the 0.9° step angle. Some people use this motor to run smoother without having to go to the higher driver expense for microstepping. The motor body is 1.7" (42mm) square and comes in 3 different stack lengths. This series offers torque up to 86 oz-in (4.4 Kg-cm). These motors can be ordered as four or six lead configurations. The 17L High-Torque Stepper Motor series is offered in three stack versions, with peak torque from 38 to 77 ounce inches. These motors are 1.8° or 0.9° with eight lead wires as standard, in both single and double-ended shaft models. Also available are IP65-rated motors (17L65 series). The 23Y High-Torque Stepper Motor series is offered in three stack versions, with peak torque from 76 to 320 ounce inches. These motors are 1.8° with eight lead wires as standard, but are available in other wire configurations, as well as single and double-ended shaft models. The 23Y9 High-Torque Stepper Motor series is offered in two stack versions, with peak torque from 180 to 270 ounce-inches. These motors are 0.9° with eight lead wires as standard, but are available in other wire configurations, as well as single and double-ended shaft models. The 23L High-Torque Stepper Motor series is offered in four stack versions, with peak torque from 55 to 320 ounce inches. These motors are 1.8° or 0.9° with eight lead wires as standard, in both single and double-ended shaft models. Also available are IP65-rated motors (23L65 series). The 23L9 series offers smoother stepping that the 23L Series due to the 0.9° step angle. The 23L9 High-Torque Stepper Motor series is offered in four stack versions, with bipolar holding torque from 50 to 300 ounce inches. This motor is 0.9° with eight lead wires as standard, in both single and double-ended shaft models. The 24Y High-Torque Stepper Motor series is offered in five stack versions, with peak torque rated from 150 to 475 ounce inches. These motors are 1.8° with eight lead wires as standard, but are available in other wire configurations, as well as single and double-ended shaft models. The economical 34Y High-Torque Stepper Motor series is offered in four stack versions, with peak torque from 467 to 1,700 ounce inches. These motors are 1.8° with eight lead wires, single and double-ended shaft models as standard, but customization is available. The powerful 34N High-Torque Stepper Motor series is offered in four stack versions, with peak torque from 650 to 2,180 ounce inches. These motors are 1.8° with eight lead wires as standard, but are available in other wire configurations, conduit boxes, IP ratings, as well as single and double-ended shaft models. Compatible with Pacific Scientific N34 series. The 34K High-Torque Stepper Motor series is the most powerful in the NEMA 34 size. Offered in four stack versions, with peak torque from 830 to 2,790 ounce inches, these motors are 1.8° with eight lead wires as standard, but are available in other wire configurations, conduit boxes, IP ratings, as well as single and double-ended shaft models. Compatible with the Pacific Scientific K34 series. The 34V High-Torque Stepper Motor series is offered in three stack versions, with peak torque from 420 to 1301 ounce inches. These motors are 1.8° with eight lead wires as standard, and are available as single and double-ended shaft models. The 34V series is the closest match to the SloSyn KML and the Oriental NEMA 34 series. The economical 42Y High-Torque Stepper Motor series is offered in four stack versions, with peak torque from 1,625 to 4,036 ounce inches. These motors are 1.8° with eight lead wires, single and double-ended shaft models as standard, but customization is available. The powerful 42N High-Torque Stepper Motor series is offered in four stack versions, with peak torque from 1,650 to 4,365 ounce inches. These motors are 1.8° with eight lead wires as standard, but are available in other wire configurations, conduit boxes, IP ratings, as well as single and double-ended shaft models. Compatible with the Pacific Scientific N42 series. The 42K High-Torque Stepper Motor series is the most powerful in the NEMA 42 size. Offered in three stack versions, with peak torque from 2,135 to 5,700 ounce inches, these motors are 1.8° with eight lead wires as standard, but are available in other wire configurations, conduit boxes, IP ratings, as well as single and double-ended shaft models. Compatible with the Pacific Scientific K42 series.